A white cooker with black accents and a clear glass door finish to look stylish in your kitchen. With a gas hob, a 61L-capacity gas oven and a separate grill, the Beko offers a range of cooking functions. 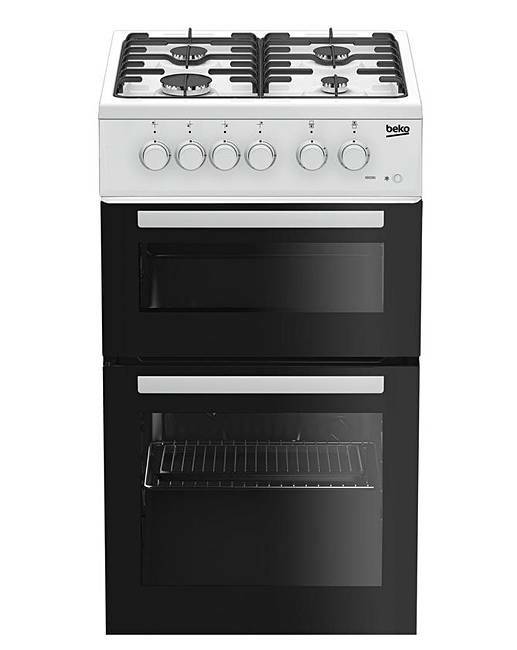 The Beko BDG581W gas cooker measures a standard 50cm wide by 60cm deep and 90cm high. The main cavity of the freestanding cooker holds 61L of gas-powered oven space to cook large and small dishes. Arrange the oven shelf on the five built-in shelf levels to suit your cooking.The top cavity of this Beko gas oven offers 27L of space to grill your food. Grill part of your meal on top, whilst the rest of your meal cooks in the oven below. The Beko gas hob offers flexible cooking options, with a choice of four burners in varying sizes to heat multiple pots and pans at a time. It comes complete with one rapid burner, one simmer burner and two regular burners. A flame safety device is also fitted to cut out the gas supply if the flame is extinguished, preventing gas leaks. This Beko cooker incorporates hardened enamel oven linings that are easy to wipe clean. Oven glass doors are also easy to wipe clean, and both inner panels can be removed completely for deeper cleans for added convenience. This gas cooker is rated A for energy efficiency to help keep running costs low, whether you use the hob, grill or single oven cavity.